2 The Shabiha-Blaming Witnesses: How? 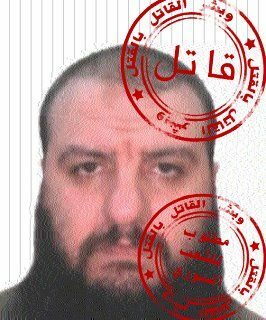 Lebanese army intelligence arrested terrorist salafist Mohiuddin Mahmoud Shehab in the Bekaa region East. Al-Manar TV quoted yesterday by Lebanese security sources as saying: "The Shahab admitted transferred arms to and from Arsal, including inward Syrian." The sources added that the terrorist Shahab was involved Hula massacre that took place in Homs nearly a year ago and claimed the lives of tens of martyrs. The sources pointed out the security of the channel that the "Shehab terrorist fled to Lebanon from Syrian territory which is now detained in Roumieh prison." FSA, key alleged witness (testimony), can decipher all AbdulRazak subfamilies (testimony), possibly killed on Dec 21, 2012, if so he was an important person (him dead and his well-attended funeral, both via Jalal Suleiman, Houla media office). "Arifah": "I heard one armed man called Akram Al-Saleh saying we won't kill him ..." SCDV: Ekremah Saleh al-Bakour, 36, married, 2 children, engineer, Defected Captain paratrooper, "Ansar battalion commander Martyred by heavy shelling in the city, martyred on Turkey road" Dec. 21, 2012. Killed at the roundabout in Taldou on Jan 30, 2013, according to SyrPer. VDC: Basel Salah Bakour from Hula, age 32, Rank:	Defected Second Lieutenant, Martyred during the clashes with the regime`s army forces, January 14, 2014. One photo dead. Armed person, killed on Dec 5, 2012 in Al-Houla area (documents.sy) SCDV entry (Video and video still included): Jehad Abdelrahman Bakour, age 35, with FSA, died in "Mousa Houla: Aqrab" on 2012-12-05. He was "Affected by his wounds that he got after the liberation of Aqrab checkpoint battle" and died from them, before he got to see their Alawite hostages massacred on the 11th. Midhat was reportedly killed in Taldou on January 25, 2014 together with Muhammad Bakkoor, Baraa` Al-’Aksh (whose family name is known from accusations of the ANNA Witnesses) and six unidentified others. Their leader Abdullah Hallaaq (see Hallaq Clan above) was wounded. A Muhammad Bakkoor together with an Umar Bakkoor were reportedly killed on Dec 13, 2013 in Latakia countryside. A Muhammad Bakkoor was reportedly killed in Taldou on January 25, 2014 (see Midhat above). Killed in Taldou on Feb 11/12, 2013, according to SyrPer. Lt. Colonel, according to Ziad Fadel one of the earliest and central defectors and plotters against the regime, died in an accident blowing himself up with explosives in a Jordanian intelligence base on June 10, 2016. "Rebel" media says he was killed by an ISIS suicide bomber. According to testimony of the "Rebel defector", a family Al-Bakkur was "very close" neighbor of the Okba Al-Sayed family. Nothing happened to them, he says, because "the brother of the family head is one of the most influential bandit chiefs in the region"
Born in Taldou, confesses to murdering captive civilians in Baba Amro in Homs. the gathering place from where they shot at the checkpoint at the clocktower is on the other side of the little river, from the side of the city center, where they had free sight of the control point on top of the baath party house slightly north of the roundabout. while they distracted them, the real attack happened from the (road leading to the roundabout from) east, where somewhere must be a "tower". a gathering place he describes is at Satto Road (from there comes the label on the German map), which is according to him not where the AbdulRazaqs live, and also not equal to main street, but the road leading to east from main street, south of the roundabout. 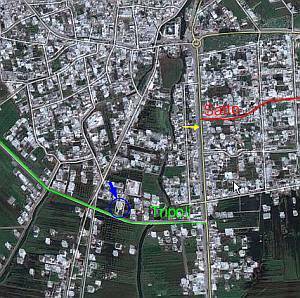 Main Street/Satto Road could be the corner where Petri found the videos with the rebels (if so, from the Hassan-Clan) shooting down south main street. another gathering place further down main street on Tripoli road (leading west), from where they attacked the military intelligence building, our defector was part of that mob. AbdulRazaqs live (also?) in the northwest. Very close to the house of the family of Al-Okba, the family of Al-Bakkur has a house, the brother of the family head is one of the most influential bandit chief in the region. Why did nothing happen to the family of Al-Hassan, where many family members belong to the bandits? Why do you think, were the families of Al-Said and Abdul Rasak completely murdered, while their respective neighbors – Al-Hassan and Al-Bakkur – have remained completely untouched? This page was last edited on 12 June 2016, at 07:51.